How can I find the divorce lawyer that is best for me? Finding a top Divorce Lawyer in Chicago is a process that many people are not completely familiar with and often times they don’t know what qualifications to look for. Some estimates suggest that approximately 30% of us will need a lawyer at some point in our lifetime. A common resource many people use is a recommendation from a friend, or referral from an acquaintance. But retaining qualified legal counsel is a process that really warrants some additional due diligence on your part. There are several ways to create a list of the top divorce attorneys in the Chicago area. Yellow Pages – You could open the phone book to ‘Chicago divorce lawyers’ and throw a dart to see which ad it hits – this would not be considered a good option. Personal Referral – If you feel comfortable asking friends to recommend a divorce lawyer that may be an acceptable place to start. Being referred to a divorce lawyer by someone who is a friend of the lawyer is not always the best choice; the referral could be based mainly on personal friendship and less on qualifications, experience and reputation. Client Referral – If you are referred to a divorce lawyer by one of that firm’s former clients, make sure that you ask the person referring you to describe what their case involved and what the outcome was. If the person providing you the referral had a case that is dissimilar to yours, a referral to that person’s lawyer may not really provide substantial information about that lawyer’s skill and experience at handling your specific case. Attorney Referral – When searching for the best Divorce Lawyer in Chicago, a great option would be to consult with a local attorney that you trust and is familiar with other lawyers that specialize in the practice of “Family Law” and ask them for a recommendation. Online Lawyer Directories – If you are not comfortable asking a friend or talking to a former client for a referral, another option is to check one of the major online law firm directories, like SuperLawyers.com. Super Lawyers aggregates peer-ranked lists of attorneys, organized by geography and practice area. 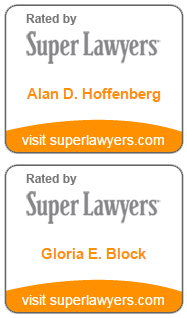 Both, Alan D. Hoffenberg and Gloria E. Block have been awarded the designation of Super Lawyers in Chicago. Only consider experienced family law attorneys that practice in the county where you live. The intricacies of family law can vary from county to county and if your case is in Cook, Lake, DuPage, Will or McHenry Counties in Illinois, you will want to make sure that the lawyer that you are considering practices there. Once you have narrowed the field to a manageable number of candidates, you should start the process of scheduling in-person meetings with each of the divorce lawyers remaining on your list. Be aware of the responsiveness of each firm or attorney to your request for an interview. You need to be sure that the attorney you ultimately retain is able to devote sufficient time to your case and if it takes 3 or 4 business days to get a call back it may be a good indication that they are too busy to give your case the attention it requires and deserves. When you begin to meet with prospective candidates, ask them about their experience with cases that are similar to yours. For example, if you are expecting an emotionally changed custody battle, ask them to discuss their experience with such cases. Another thing to realize is that the attorney you meet with may not be the one who will actually be assigned to your case. Ask which attorney will be working on your case, and ask to meet them. They will likely be your contact person and it is important that you feel comfortable working with them. You should also consider the fact that you need a qualified divorce lawyer, one with years of courtroom and trial experience, fits your personality and is understanding and sympathetic to your specific situation. You will be sharing many intimate details of your life with your divorce lawyer, and he or she will be advising you on important decisions that may impact the rest of your life. If your personalities clash and you are unable to communicate effectively, you’re case may not go as smoothly as planned. The process of hiring a divorce lawyer is one that, depending on the complexity of your case, may justify a little extra homework on your part. The final decision may be a subjective one, but if you take the time to create a list of qualified candidates you will have a better chance of finding a Top Divorce Lawyer in Chicago.